Product prices and availability are accurate as of 2019-04-23 07:20:00 UTC and are subject to change. Any price and availability information displayed on http://www.amazon.co.uk/ at the time of purchase will apply to the purchase of this product. Stovetop espresso maker produces rich, authentic Italian coffee in just minutes. The aluminium pot features distinctive 8-sided design for optimal performance. 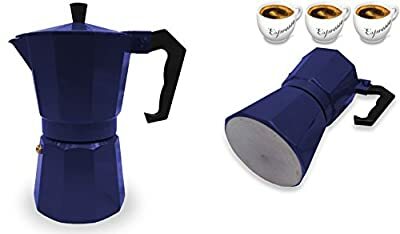 This polished aluminium traditional continental steam-infusion espresso maker will make the perfect espresso any time. A popular and traditional design ensures that you will achieve that irresistible percolated coffee taste every time. 3 cups / 200ml / 6.5oz Top/Base Diameter: 8cm Height: 15cm. NOT for use on induction hobs. Comes in a box.